Marine and subsea unmanned vehicle technology is playing an increasingly greater role in underwater archaeology, including the search for the historic shipwreck Franklin. For centuries, the ever-changing sea ice of the Northwest Passage made the route through the Arctic Ocean unpredictable and, on occasions, virtually impassable. Yet, since the 1500s the promise of connecting the Atlantic and Pacific Oceans, and the economic benefits which would follow, were enough to entice many expeditions into this treacherous pass. One such explorer, Sir John Franklin, set sail in 1845 from England with his crew on board HMS Erebus and HMS Terror, vanishing almost without a trace. In September 2014, more than 170 years on, search expeditions led by Parks Canada discovered the wreck of HMS Erebus and two years later, HMS Terror was found. While advancements in technology have proven useful to underwater archaeologists in the search for Franklin’s ill-fated crossing, in a remote, harsh environment, even the most advanced underwater vehicles have limits. In Canada, much of modern history in the Arctic comes back to Franklin and his lost ships. As a result, many of the search expeditions that were launched with the intent to locate them ultimately charted much of the Arctic Archipelago, geopolitically underpinning Canada’s sovereignty Arctic territory. In comparison to traditional archaeology conducted on land, underwater archaeology is inherently reliant on technology to a much greater extent. The difficulties that are represented by searching for and locating sites within a marine environment, working on and under the water offers an array of challenges to the archaeologists involved. This includes the caprice of weather, often limited underwater visibility, cold water and its chilling effect on dexterity and ability to concentrate, as well as having a limited supply of air to conduct underwater tasks. 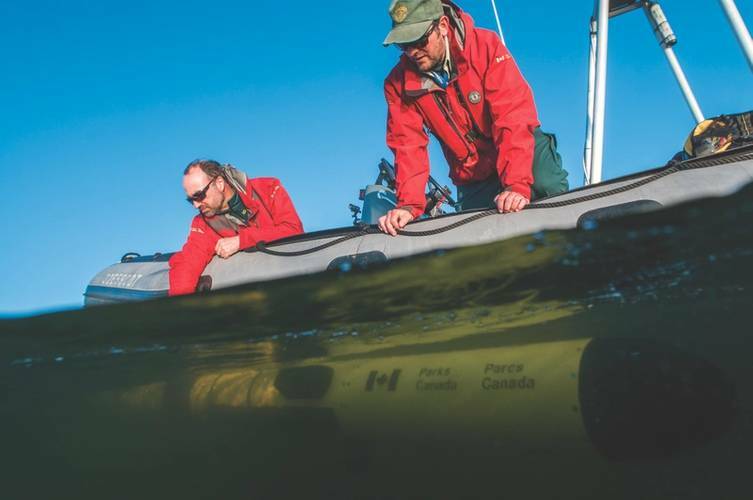 In 2012, Parks Canada engaged the University of Victoria Ocean Technology Lab (OTL). OTL contributed a Bluefin 12 autonomous underwater vehicle (AUV), a 12-inch diameter unit equipped with Klein UUV 3500 side-scan sonar transducers. An AUV has the advantage of diving beneath the surface of the waves where it can render very stable sonar imagery in sea states that would otherwise stymie traditional towed side-scan instrumentation. In 2014, Defense Research Development Canada (DRDC), the R&D branch of the Canadian Armed Forces, joined the project. DRDC provided a 7.5 meter Arctic Explorer AUV equipped with a Kraken second generation interferometric synthetic aperture sonar system (INSAS) developed for mine counter-measures. 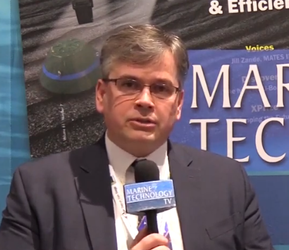 Harris and his team applied AUV technology to the search for Franklin’s ships. While the team had somewhat mixed results, this reflects not on the technology itself but on the challenging environment in the North. As such, the discovery of the shipwrecks came about through the marriage of marine survey technologies and painstaking research into Inuit accounts since the 19th century as to what they saw befall the Franklin Expedition all those years ago. “While the capabilities of the technology were successfully trialed, the environmental conditions severely restricted its deployment ultimately. The ice cover in the Victoria Strait that year was almost complete, so there were just tiny little pockets where we could safely deploy the vehicle. You can prepare all the technology you want but you’re still in many ways at the mercy of the elements, and that’s certainly our experience up north since 2008,” said Harris. Inuit’s traditional knowledge directed the team to the Queen Maud Gulf, a body of water farther south of King William Island in Nunavut, where HMS Erebus was eventually discovered. While the Erebus discovery validated Inuit accounts in terms of there being a wreck somewhere in Wilmot and Crampton Bay, this still prescribed an enormous area, in excess of 800 square kilometers, to be systematically scanned over five years. Supported by much historical research, marine technology, and guided by a dedicated and disciplined systematic approach, and a lot of patience, the team successfully discovered HMS Erebus in 2014. 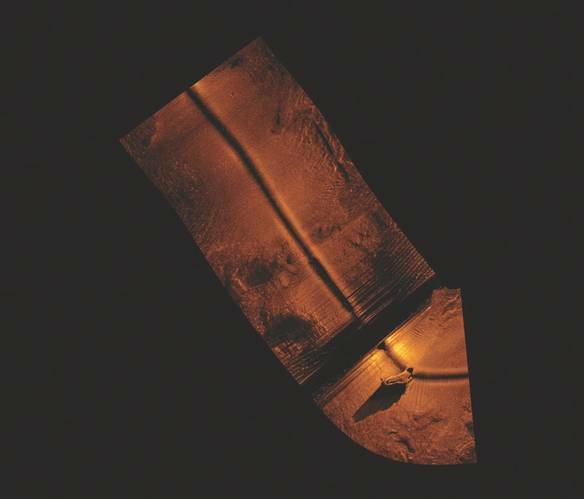 “When the Erebus finally appeared on the side-scan sonar screen it was a moment of absolute jubilation… but also relief that we hadn’t wasted our time for five years scanning the seafloor in vain. In the back of your head is the anxiety that maybe on a day when the weather was marginal, and sea state all riled up, that maybe we missed something on the edge of the sonar swath and have been searching pointlessly ever since. So, when the wreck finally appeared, unmistakable and clearly a wreck, it was a moment of pure elation and relief,” recalls Harris. Due to the complexity of the sites, the Parks Canada underwater archaeology team expects many years will be spent studying both shipwrecks. Both sites have maintained considerable structural integrity and three-dimensionality. While this presents many archaeological opportunities, in terms of preserving diagnostic artifacts within, not without a share of technical challenges behind delving into the bowels of the ships so the team can learn what happened. 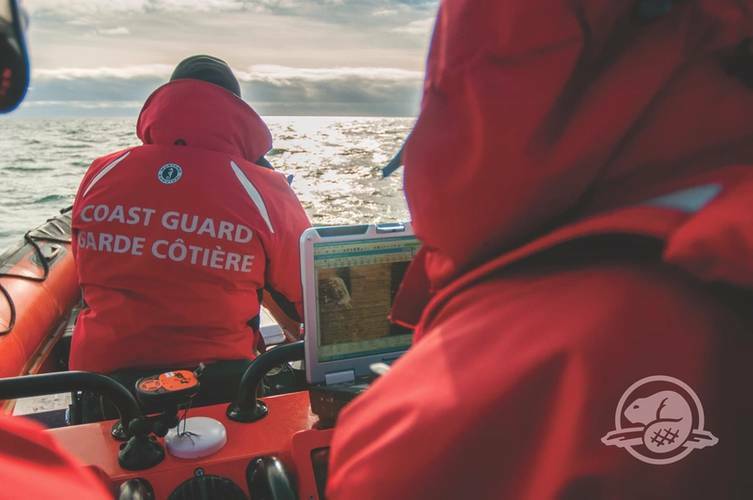 Parks Canada contacted Deep Trekker to provide a purpose-built remotely operated vehicle (ROV) for its mission to investigate the inside of HMS Erebus. 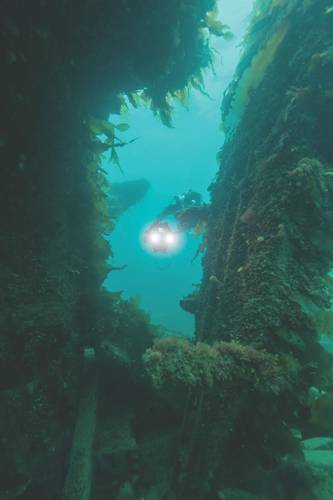 Parks Canada had planned a dive mission during the summer but needed a way to also view deep inside the vessel which would have been too dangerous for divers at that time, until mobile elements of the upper deck are eventually shored-up and stabilized. Deep Trekker’s ROV was selected for its maneuverability into small areas and ease of deployability from small open boats. In addition to the 270-degree camera view and 180-degree pitching system, a full HD camera system will be added to Deep Trekker’s ROV for future surveys. 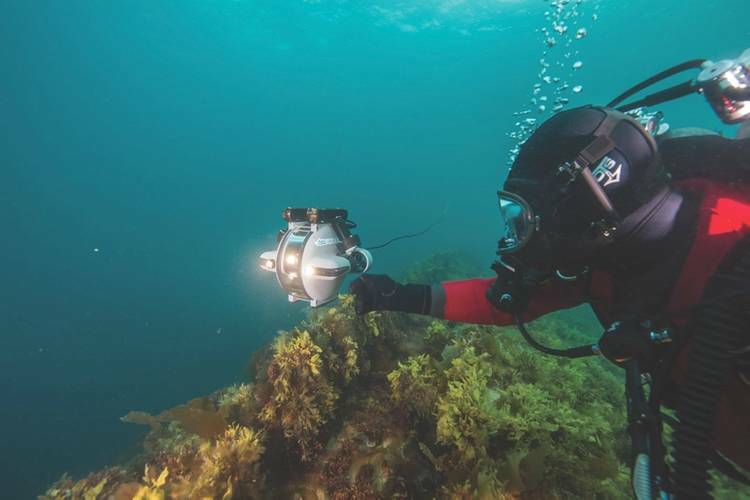 When combined with the purpose-built inertial motion unit and finely-tuned thrusters this allowed underwater archaeologists to remotely access and document previously hidden recesses of HMS Erebus. Parks Canada’s underwater archaeology department has historically been eager to embrace technologies that they believe can help document these complex structures in a very remote and challenging work environment to get the most out of short windows of survey opportunities. As part of this quest, they have recently procured a very high-resolution R2Sonic 2024 multi-beam echo sounder system (MBES) with a 200-400 kHz and 700 kHz ultra-high resolution imaging capacity. Also, as part of this MBES, are an Applanix POS MV 320 inertial navigation system and AML Micro and Minos sound velocity sensors. In addition to the MBES, the team have also procured an Iver3 AUV equipped with ring laser gyroscopic INS, for operating at high latitudes which render traditional fluxgate compasses useless, Klein UUV 3500 SSS, and Marine Magnetics Explorer Overhauser magnetometer. They hope to use this unit to systematically survey the extended debris fields of both wrecks. In the field of underwater archaeology, forensic tools are also becoming increasingly important. Harris hopes that DNA analysis will figure prominently in their ability to tease out information about the Franklin expedition, to try to identify from DNA evidence who the final survivors were on board. 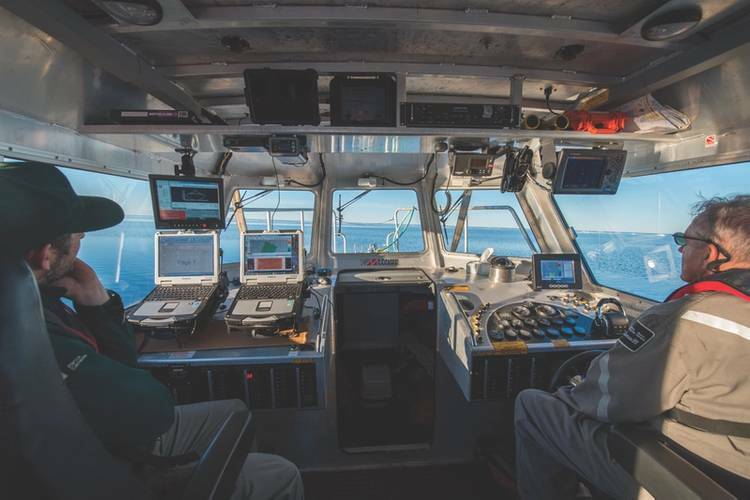 Marine technology which can work alongside underwater archaeologists through high-resolution imaging of complex sites, improved capacity to be used in challenging conditions and aid in the forensic analysis will be highly valued in future expeditions. In the end, advancements in the field of underwater archaeology aided by marine technology comes down to cost and accessibility of these tools, and the mercy of the elements.